NEW YORK, NY, October 8, 2013 — ePromos Promotional Products, Inc., a leading online provider of promotional products, has earned a spot on the 2013 Inc. 5000 list, an exclusive ranking of the 5,000 fastest-growing, privately owned companies in the United States. In its 32nd year, the list remains the gold standard of entrepreneurial business awards. This marks the fifth time ePromos has been an Inc. 5000 honoree. The achievement aligns ePromos with powerhouses including Microsoft, Zappos, Patagonia and other distinguished companies. Despite a dismal economy, the median growth rate of 2013 Inc. 5000 companies was an impressive 142 percent. The companies in this year’s list have a combined job creation of more than 520,000 positions in the past three years, with aggregate revenue among the honorees reaching $241 billion. 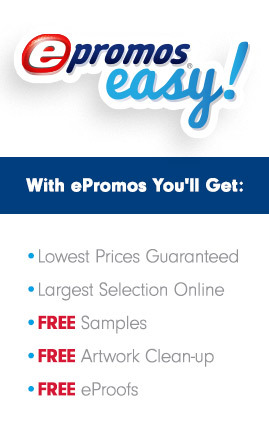 ePromos has a team of 120 promo know-how people across 11 states, and a newly enhanced website at www.epromos.com, which features more than 15,000 promotional products. Founded in 1998, ePromos is one of the fastest growing promotional products distributors in the world and a 13-time winner of the Promotional Products Association International’s Web Award. ePromos offers more than 15,000 promotional products and an expert staff of Brand Consultants to help customers grow their businesses with innovative and creative marketing products and campaigns. For more information, go to www.epromos.com.